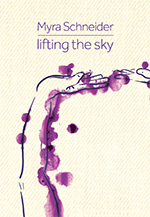 Myra Schneider’s tenth collection, Lifting The Sky, explores the theme of survival in many contexts: from the perils facing refugees and survivors of war to the detailed and tender mating ritual of endangered seahorses. Threats to the environment are balanced by the preservation of delicate objects in the sequence about the Sutton Hoo burial site, which is also a meditation about what survives death. The final narrative sequence ‘Edge’ is a tour de force, presenting a diary of artistic and emotional breakdown due to depression followed by healing and restored creativity. Myra Schneider enters the daunting yet essential regions where we face ordeals and seek understanding in and of the toughest places in the world, both private and public. Schneider is a significant and much-loved poet – in whose work a critical despair at the state of the world is balanced by hope, consolation, attention and celebration. Myra Schneider has become an essential poet. Nobody else manages her fusion of the domestic and the global as well. Myra Schneider has lived in London since she was nineteen. Her first collection of poetry, Fistful of Yellow Hope, was published by Littlewood Press in 1984. Since then she has had nine full collections of poetry, mainly from Enitharmon Press. The most recent is The Door to Colour (2014). She has also had three pamphlets from Second Light Publications. Her other publications include fiction for young people and three books about personal writing. The two still in print are Writing My Way Through Cancer (Jessica Kingsley, 2003), a fleshed out diary with poem notes, poems and writing ideas; and a resource text written with John Killick, Writing Your Self (Continuum Books, 2009). She has tutored for the Poetry School since Mimi Khalvati started it in 1997. She is consultant to the Second Light Network for women poets and has co-edited five anthologies of poetry by contemporary women poets. She was shortlisted for a Forward Prize in 2007 and her work has been broadcast on Radio 4 in Poetry Please.